“Not everyone with a disability experiences their condition in the same way. It therefore follows that reasonable accommodation cannot be the same for every individual with a disability.” So how does an employer reasonably accommodate a person with a disability in their workplace? This was just one of the key questions and messages surrounding this year’s 5th Annual Disability Conference, hosted by the Progression team (for the first time in Cape Town) on 9th June 2016, which explored the tools, technologies and systems for reasonably accommodating people with disabilities in the workplace. 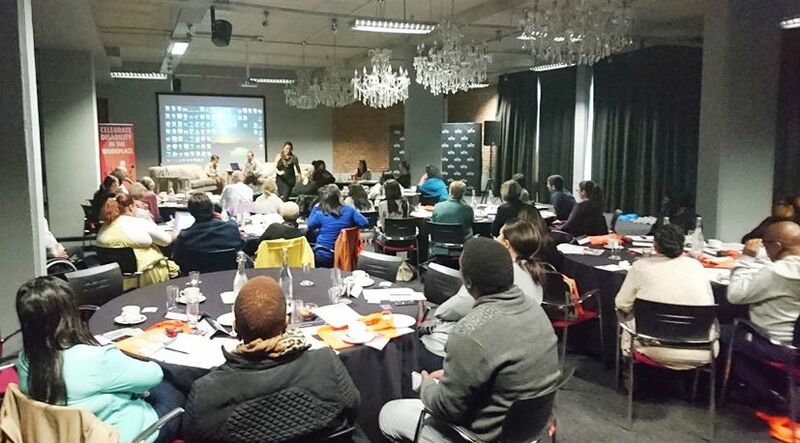 The conference was well attended by HR and EE Managers, Transformation Specialists, Health & Wellness Practitioners and CEO’s from around South Africa. Tarryn Mason, General Manager at Progression and host for the 2016 event, guided speakers through a variety of topics linked to reasonable accommodation in the workplace in an informal ‘Q&A’ style format, providing a unique opportunity for the audience to build on ideas and actively contribute to the value of the discussions. Imogen Rossam, Consultant at Progression, whose presentation explained the background of what reasonable accommodation is and unpacked the best practice approach to its implementation, highlighted the inequality yielded by the medical model of disability and how it can be substantially limiting in an individual’s endeavour to gain access to the workplace in a fair manner. “Emphasis needs to be placed on the social model of disability, which observes the structures and systems of society as barriers for people with disabilities rather than the condition itself. It is within the framework of the social model that the conversations necessary for exploring reasonable accommodation take place.” says Imogen. Joining Imogen in an enlightening discussion, Justene Smith, Disability Specialist at Progression, spoke to the fact that not all disabilities are physical, nor display visible or obvious symptoms. In her segment, Justene unpacked different types of mental disabilities, including some of the challenges experienced and possible types of reasonable accommodation. Justene highlighted that ongoing support is critical in the successful management of invisible disabilities. In addition, supportive policies within the organisation can assist in ensuring that best practice is followed at all times. Continuing the theme of inclusive workplaces, delegates were introduced to Architect & Universal Access Consultant, Hiten Bawa, and Occupational Therapist, Keshika Naidoo, who shared insights on what is involved in creating an accessible environment. The discussion followed the principles of universal design as well as the minimum standards laid out by the National Building Regulations SANS10400-S, Facilities for Persons with Disabilities. An open discussion took place around the various considerations for people with disabilities, tackling topics such as accessible toilets and parking. Hiten and Keshika both maintained that whilst adhering to the minimum standards is important, employers need to give consideration to ensuring that their workplaces are as fully accessible as possible. In the case where an organisation is not the owner of the building they occupy, conversations need to take place with landlords to implement the necessary measures to improve accessibility. Danny also took the audience through the Bellman range which features a vibrating/flashing accessibility device for people with hearing impairments. The equipment includes alarm clocks, devices for notifying people when there is someone at the door or when the telephone is ringing. And most significantly, the technology can alert the wearer to possible life-threatening emergencies, such as a fire. For many delegates, the demonstrations were quite profound as very few people are aware of the types of technologies and devices available in South Africa, some of which are very affordable. “I found Danny’s presentation to be very informative, I was not aware that there was so much assistive technology available,” said one delegate of the event. In addition to the main messages that were highlighted at the event, it was also further emphasised that a person who has disclosed their disability has the right to confidentiality; that although there are a number of tools available to reasonably accommodate a person with a disability, the process does not always have to be an expensive one; and if we want to encourage inclusive and accessible workplaces, reasonable accommodation needs to be considered or explored at any point in the employment cycle.